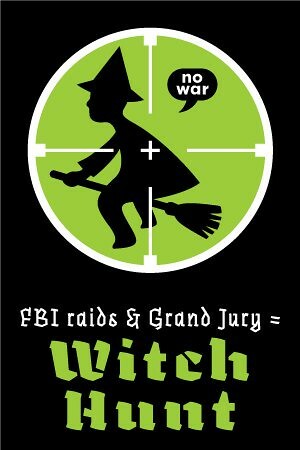 Alleged evidence the Federal Bureau of Investigation (FBI) used to obtain search warrants for raids on the homes of antiwar and international solidarity activists in the midwestern United States were unsealed. The files reveal a persistent effort by an undercover FBI agent to get activists to send money to the Popular Front for the Liberation of Palestine (PFLP) so the government could charge them with material support for terrorism offenses. The raids took place on September 24, 2010, in the cities of Chicago, Minneapolis and Grand Rapids, Michigan. Fourteen activists were subpoenaed to testify before a grand jury. The FBI alleged they had provided “material support” to “designated foreign terrorist organizations”; specifically, the PFLP and the Revolutionary Armed Forces of Colombia (FARC). Yet, more than three and a half years later, the activists have not been charged with any crimes. (Subsequently, nine other activists were issued grand jury subpoenas). Jessica Sundin, one of the activists who was raided, subpoenaed and continues to live with the possibility of one day being charged, was part of the effort to unseal files the government had initially sealed indefinitely because this was a “terrorism” case. The activists wanted the files public to hopefully find out if the investigation into activists implicated was over or not. They also did not think it was right for the government to continue to keep this information secret. From July 2008 to as late as May 31, 2010, an undercover FBI agent known to activists as “Karen Sullivan” infiltrated them as they prepared for a major antiwar demonstration at the 2008 Republican National Convention. She then became a member of the Freedom Road Socialist Organization (FRSO) and provided political intelligence to the FBI on how the organization’s private operations. Sundin pointed out that the affidavit makes it seem like an undercover agent met someone in FRSO, like at the library or the coffee shop. What really happened is the undercover agent met up with a group of activists organizing as part of the Antiwar Committee (AWC) (which was targeted and raided by the FBI too). They were the “chief organizers” of a major march. Months were spent trying to secure permits for the action in downtown St. paul to demand an end to the wars in Iraq and Afghanistan. However, the affidavit makes no mention of this part of the FBI operation when intelligence was being fed to authorities for the national special security event. The content of the affidavit seems to consist of the most sensational and often out-of-context statements and jokes uttered by activists in the presence of “Sullivan.” They are accepted as serious and fact, and the humor and cultural context is not understood by FBI agents. It is as if they still suffer from an institutional and historical bias against leftwing organizing that can be traced back to when the Bureau was founded and operated by J. Edgar Hoover with a commitment to destroying and annihilating the effective organizing efforts of communists and socialists. What is Asserted in the FBI’s Affidavit? A second undercover officer apparently pretended to be “Sullivan’s” life partner and was shown a video of Sundin on a trip in Colombia where she met members of the FARC in 2000. “Sullivan” was invited to go on a solidarity trip to Palestine in August 2009. The activists helped her fundraise to go on the trip, and “Sullivan” apparently asked multiple times about whether the activists going on the trip would raise money for the Palestinian Women’s Union, which hosted the trip. The undercover agent also determined that the Women’s Union has members, who are a part of PFLP, and concluded money given to them would likely fund the purchase of guns. While it may seem like this would make a case to bring charges against the activists, apparently nothing happened that the FBI wanted to prosecute at that point. Multiple transactions are described in the affidavit in the months following August but none indicate proof of “material support” for PFLP. And, significantly, “Sullivan” was not able to get into Israel with the delegation because when she arrive in Israel, she and two other delegates were denied entry by Israeli security. The pressure to conclude the operation and prosecute someone for an actual crime increased. By March 4, 2010, the operation became one where “Sullivan” was engaged in an effort to entrap one of the activists into sending $1,000 dollars to a foreign terrorist organization. So, “Sullivan,” an undercover FBI agent, informed activists she wanted them to ensure money reached women who were part of a US-designated foreign terrorist organization. She insisted after it appeared the money might go to Palestinians, who were not a part of the PFLP. She was part of a perverse scheme to convince activists that her father had died and it was his last dying wish to get money to the PFLP because he had treasured a documentary on Palestinian militant resistance to Israeli occupation. A span of more than two months elapsed. None of what happened is highlighted in the description of this effort to get the activists to send $1000 to the PFLP. Suddenly, May 20, 2010, “Sullivan” was back at it again trying to get the money to this US-designated foreign terrorist organization. She managed to get an activist to text someone about giving money to an “NGO,” which appears to have been twisted into PFLP works with NGOs so the activist was going to help get the money to the PFLP. Finally, there was an FRSO national meeting at the Crowne Plaza Hotel in Northbrook, Illinois for dues paying FRSO members from May 28 to May 31. “Sullivan” was committed to achieving success by getting some member to transfer the money to the PFLP. “Yeah, yeah,” like go away from me now and stop asking about sending money to a terrorist organization? Or “yeah, yeah,” like, yes, your money will get to where you want it to go? It appears this person did not say it had given “substantial material aid” to PFLP in the past. To PFLP was grafted onto the statement by the FBI. The money would go to wherever the money went during the delegation in 2009, which meant probably not the PFLP or else “Sullivan” would not have spent the past months trying to get an activist to commit the crime of material support for terrorism. The activists involved in the conspiracy, if one existed, would have been arrested after the 2009 trip. Raids were not carried out on the homes or the office of the Antiwar Committee until the final week of September 2010. That is about four months later. What was the problem? Obviously, the FBI didn’t know if money was given to the PFLP and, ultimately, it just decided to raid homes and an office, seize property and conduct a search of computers and records to see if it could uncover the evidence the agency desired so prosecutors could bring a case. Betty Medsger, in her book, The Burglary: The Discovery of J. Edgar Hoover’s FBI, explores this in great detail as she tells the story of activists who broke into the FBI’s office in Media, Pennsylvania, and took files which exposed domestic surveillance in the 1970s. These operations, she notes, were to “maintain the status quo and quash new ideas by harassing people into silence and passivity.” For example, the FBI used informant Robert Hardy to become an “agent provocateur” and advise a group of peace activists on how to “break into the draft board office.” He “taught them techniques” they did not know and had not used in previous draft board raids. In the case of twenty-three activists, who have faced a federal grand jury investigation for over three years, they are Americans who have organized in solidarity with the people of Colombia and Palestine that are engaged in life and death struggles. The government has put forward no clear evidence that any of the money being donated specifically went to groups designated as terrorist organizations. In fact, the FBI would have the public believe these activists provided “material support” to the FARC because the FBI happens to believe there are FARC members, “who do not publicly acknowledge their FARC membership and who are members of various unions in Colombia.” What the FBI fails to grasp is it would not be a crime to support the union if it is not a designated terrorist organization. What is their crime? They are on the side of political struggles in countries, which the US government has opposed through its foreign policy. Yet, years after the raids, these activists have not gone into hiding. While they have not organized any solidarity trips, they have spoken out and fought back and, as Sundin said, refused to “hide in the shadows.” They have stood behind the work they have done and “created a real challenge” for the government to proceed with this case, according to Sundin. The activists’ lawyers do not know whether the government plans to eventually charge these activists with “material support for terrorism” charges, which if it were to happen would be incredibly serious. But, for now, the public can see the dubious evidence at the center of the case—evidence that seems to involve an undercover agent once again trying to get activists to engage in criminal activity as means to control and repress individuals courageous enough to dissent against deeply entrenched policies of their government.